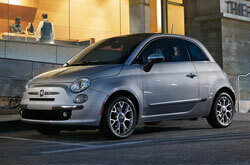 The FIAT 500 brings all of its fun and personality to the new model year. 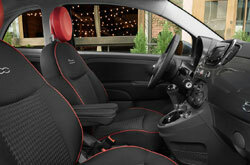 With its distinctive styling and zippy drive quality, the FIAT 500 remains a fan favorite. For 2017, the trim levels have been cut down but each of them has been updated with modern technology. 2017 FIAT 500 reviews note that it's hard to not have fun while driving this car, including Edmunds.com's review which says that few other competitors match its playfulness. 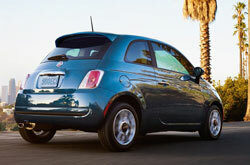 The FIAT 500 in Scottsdale is available as either a hatchback or a convertible. In the base level 500 Pop, standard features include cloth upholstery, a 7-inch display screen for the Uconnect infotainment system, Bluetooth connectivity and voice controls. The convertible version of the Pop also has rear parking sensors and a windscreen. The Lounge adds chrome exterior accents, an auto-dimming rearview mirror, heated front seats and satellite radio. There are also several optional features to choose from. These include a Beats Audio speaker system with a subwoofer, a navigation system and styling enhancements. 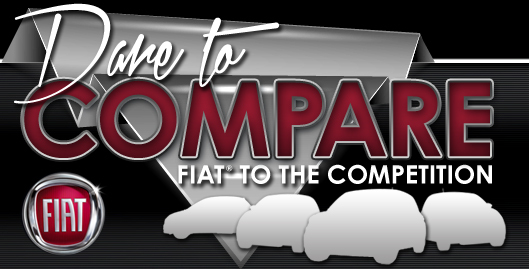 Visit to test drive the 2017 FIAT 500 in Scottsdale and see why reviews call it fun to drive. 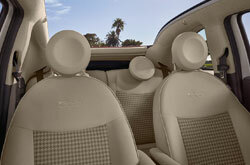 The 500 Pop and Lounge are equipped with a 1.4-liter four-cylinder that generates 101 hp and 98 lb.-ft. of torque. Front-wheel drive and a six-speed automatic transmission are standard. Fuel economy is also impressive, rating in at an EPA-estimated 27 city/33 highway mpg. Standard safety equipment on the 2017 FIAT 500 includes stability/traction control, antilock brakes, an extensive set of airbags and hill start assist. Rear parking sensors are also included on select models. Additionally, the 2017 FIAT 500 scored well in government crash tests, receiving five stars in the side crash test and four stars in the frontal and rollover tests. 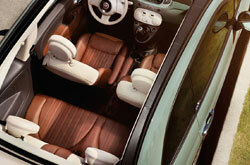 Want to Review More Info About the Fiat 500? If you've been in the market for vehicle models like the 2017 Chevy Spark, Mini Cooper and the Volkswagen Golf near Phoenix, you should examine the 2017 Fiat 500. You may find that it is a definite match for you, with its sleek design and excellent in-car technologies. Take advantage of facts from our report to determine if the 2017 Fiat 500 is suited for your lifestyle. Also make sure you take a peep at Fiat factory offers on our site! 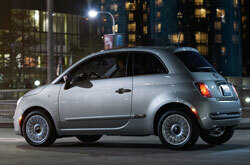 Visit us right away if you're looking for an in-town Fiat 500 dealer with lease offers you won't want to miss. To guard yourself from making a take home you stress out about, make sure you be mindful of the specifics that you find beneficial from our 2017 Fiat 500 review. We have a lot of Fiat 500 models for sale at Fiat of Scottsdale in Scottsdale, AZ; stop by to be pleased with a test drive - scheduling an appointment on our site is easy. Check out our video walk-around to take a glance at its stylish cabin before your visit.